All these rich greens usually hint at vegetation, but what's pictured is an arid, salty Chinese land almost totally inhospitable to plants. Instead, those are the markers of a brine rich in minerals, concentrated as the water evaporates. Dabuxun Lake in China is a strangely eye-catching mine, where water evaporates to leave behind thick layers of mineral salts. 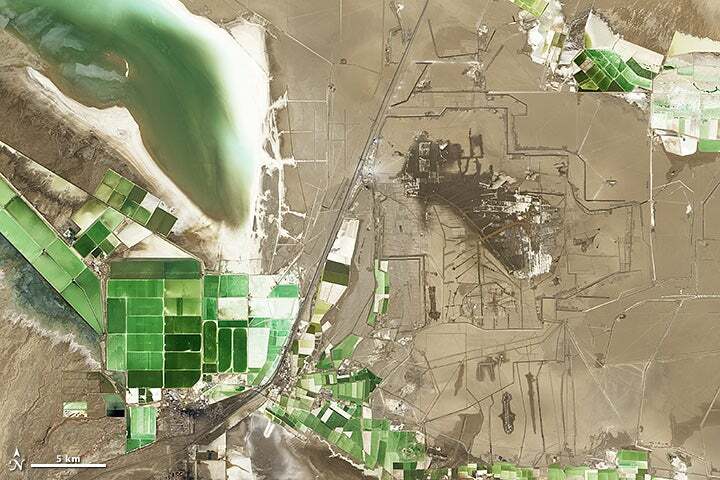 While humans are exploiting it now as a natural resource, the lake may be the final remnant of an ancient salt lake lingering in the area for the last two million years. Top image: On the shores of Dabuxun Lake in central China. Credit: NASA/Scott Kelly. Thank you to Ewan Mellor for identifying the location for us!